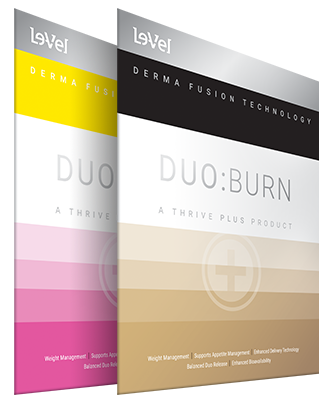 DFT BURN is the latest advancement for the THRIVE 8-Week Experience and the Derma Fusion Technology line of products. Catapulting off the advancements made during the development of DFT DUO, BURN is one of the greatest steps forward ever made for human nutritional weight management. BURN utilizes a special concentration of Forslean 95% extract, which is one of the most clinically-studied ingredients globally for weight loss and weight management. BURN’s proprietary formula also utilizes an additional 67% of the amount of bulk ingredients compared to DUO's formula. This huge jump is by far the largest amount of premium grade bulk ingredients with which we’ve ever coated any DFT application. BURN has also been formulated to increase appetite management. Note the use of “appetite management” rather than “appetite suppression,” as our bodies are intended to, and need to, have food. Our goal with BURN was to engineer the formula in a manner where it’s curbing your body's cravings for the wrong foods, and BURN thermogenesis is actually intended to speed up your system by burning calories and stored fat for your body's energy. Many THRIVERS will notice they are actually hungrier while using BURN, which is a sign that their system is “on the move”, burning calories and fat. While using BURN and experiencing thermogenesis hunger (a desire to snack in-between meals), if you pick appropriate foods, you'll boost the effect of BURN. Accordingly, moderation with carbohydrates and sugar is critical. If you consume too many carbs and too much sugar, your body will look to the incoming carb and sugar intake for its fuel. When your body has less carbohydrates and sugars, it turns to stored fat and calories to supply the body's energy. BURN is not only intended to help your cravings but, even more so, it's designed to jumpstart and propel you into a state of BURN thermogenesis. The last point to note is that BURN’s high grade adhesive has been uniquely engineered specifically for BURN and is different than the adhesives on the other DFT products. The adhesive's role is to help dilate the pores of the skin to allow for the bulk load of ingredients in BURN to properly, and more effectively, transfer to the DERMA (skin). For best results with your weight and appetite management goals, use THRIVE BURN with THRIVE Lifestyle Capsules and THRIVE Lifestyle Shake. Best results are achieved from a moderate approach to your daily intake of carbohydrates and sugars. Proper sleep and weekly exercise are also recommended to achieve maximum thermogenesis from your BURN application. The greatest step forward in weight management is here—welcome to THRIVE BURN.